Having had a bit of time on my hands lately, I was looking for a fun and easy project that didn’t require too much concentration. This scarf, constructed almost entirely of garter stitch – was the perfect candidate. Using one strand each of Habu Stainless Steel and K1 Linen, I cast on roughly 200 stitches, then knit 10 rows. On the next row, I K1M1, essentially doubling the number of stitches on the needle. After another 10 rows, the stitches were again doubled, and so on, until ending up with 800 stitches on needles and roughly 40 rows. After casting off, the edges were finished with double crochet just to even them up again. The final touch was a lovely pearl brooch – and voila! – a classic ruffle scarf done using garter stitch and increases. 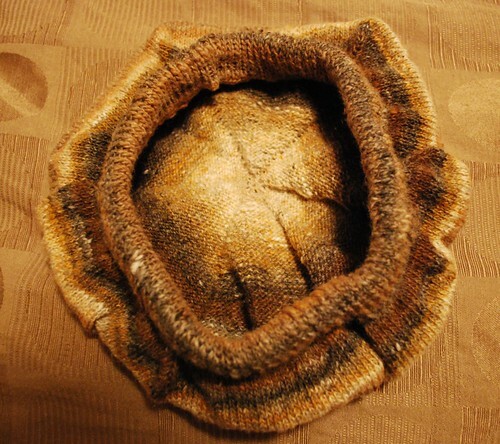 This was a quick hat, designed to provide maximum coverage while still fitting quite close to the crown. Having managed to get my hands on some lovely Noro Kureyon sock yarn, only to be dissatisfied with it for socks (it’s not very hard wearing, being a single ply yarn), I thought it would make a lovely hat. A quick stash dive yielded 3 x 100g skeins, however the hat all up used only around 75g – there’s about a quarter of the skein left. I suspect a matching scarf may be in the works. 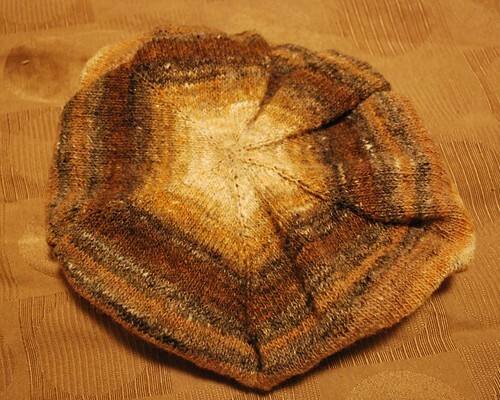 The Noro Kureyon knits up beautifully – my only concern was a tendency to tangle, but in fairness it is a centre-pull skein, which I was pulling from the centre! The band is doubled over and secured to the inside using crochet, then wide elastic is used to help the hat stay in place. This also makes the band seem to be quite dense – which I think adds to the design. 2.75mm circular needle (for knitting magic loop) or 2.75mm DPNs, 6 x stitch markers, approx 50cm of elastic which is 2-2.5cm wide for threading through band, safety pins, yarn needle, 2.75mm or similar crochet hook for doubling over and securing the band, buttons or other accessories to decorate if desired. Work for crown of head by * knitting to stitch before stitch marker, kfab, slip stitch marker from left to right needle, kfab*, repeat from *, knit to end of row. Essentially, you are increasing 12 stitches on each round. Repeat this pattern 41 times more until you have 270 stitches. Decrease 12 stitches in each of the next 8 rows as follows: *knitting to two stitches before stitch marker, knit 2 together (k2tog), slip stitch marker from left to right needle, k2tog*, repeat from *, knit to end of row. You should now have 174 stitches. Work 24 rows of 1 x 1 rib (knit 1, purl 1), case off loosely. Measure elastic to desired fit and cut. Using safety pins, thread elastic through doubled over band and sew elastic together. Sew in any loose ends, in particular the cast on (9 stitches) will need to be closed over properly. Press or block if desired. To save myself from going stark raving bonkers studying for my MBA (Computing), I’ve been knitting in between study sessions. This jumper had been on needles since about January, and time was rapidly running out to be able to wear it this winter. The design is very simple – it’s a top down raglan, with the sleeves held on stitch holders while the bodice is knitted. As I’m pretty curvy, I used short row shaping for the bust, then used stitch holders evenly spaced (two on the front about a third in on either side and two on the back but slightly closer to centre) to mark decreases for the waist. Because I’m bottom heavy, the hips fan out quite a lot, using the same markers from the wait decreases. While the cuffs of the sleeves are done in a simple 2 x 2 rib, the bottom band and the neckline are done in double crotchet so that they sit flat without adding a lot of texture or bulk. Overall I’m very happy with this effort – although it’s a closer fit than I would have liked! Never mind, hopefully it will be a looser fit next winter! The yarn chosen is Lincraft’s Silky – I don’t think it’s made any more – which is a good thing. Although the end result is pleasing, it has to be one of the worst yarns ever. There were up to 6 joins per 50g ball, and it did shed a bit, which is to be expected given the amount of microfibre content.